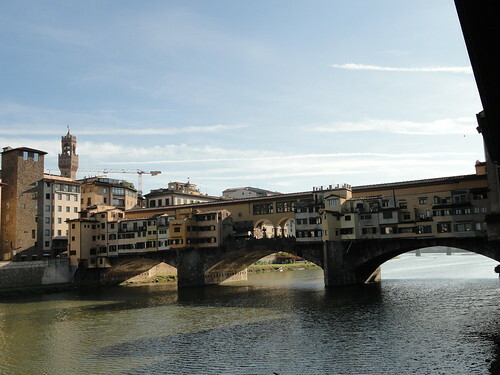 Leaving Florence was a bit of an adventure. The first few hundred miles in a rental car are always interesting, especially if you can’t read the language, there are round-abouts, the streets are narrow, and the other drivers are Italian. It was stressful and all I had to do was ride along. My dad is the master of out of the State’s driving. The original plan was for all of us to share the chore, but Italy isn’t the best place to learn how to drive a stick so I was kicked out of the rotation. Amazingly we got out of the busy city and into the countryside with only a two or three wrong turns. The Tuscan countryside is gorgeous. I know people always go on about how beautiful Tuscany is, but the hype is deserved. It wasn’t what I expected, at least not the region we spent most of our time exploring. I’d aways pictured rolling fields of vines, kind of like Illinois with vines instead of corn, but the topography is way more interesting. In the Chianti region it’s more like the Ozarks. Old mountains and streams. Roads that weave up and down steep hillsides covered in forest except for the feilds that must have been painstakingly cleared. Everywhere you look there’s a picture to be taken. Rolling golden rows of grape vines framed by thick green forest. 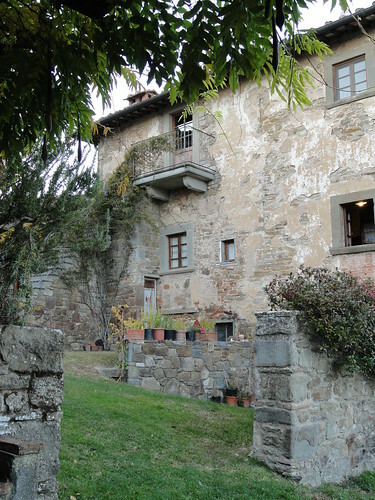 Stone houses and villages perfectly maintained for hundreds of years. 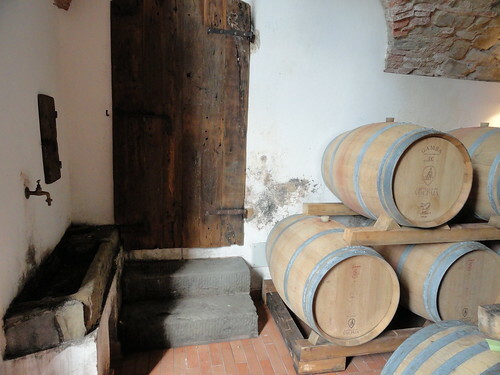 We stayed in a small apartment that was part of a working winery in a tiny little medieval town named Volpaia that wasn’t even on the map. 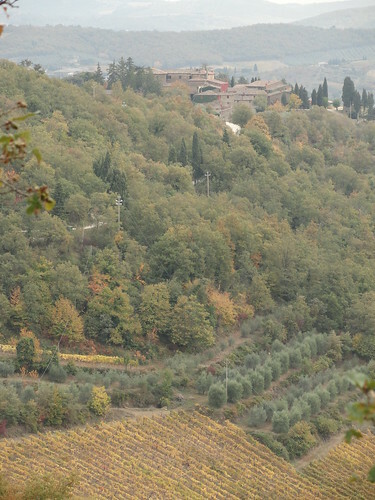 Most of the village is owned by the winery and produces an amazing Chianti as well as some divine olive oils and balsamic vinegars. Sadly we lost the olive oil and mint balsamic vinegar at the airport. Somehow it ended up in my dad’s carry on baggage. Very depressing. 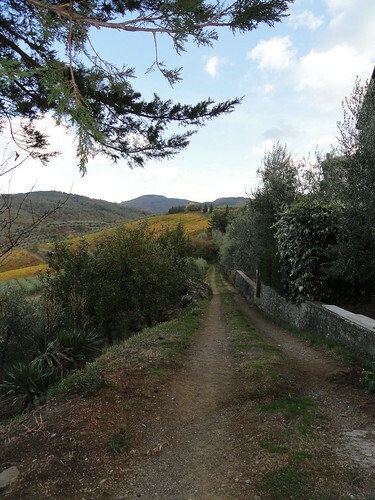 Our time in Tuscany was spent exploring the countryside and many of the villages that our travel agent highlighted on our map. It was wonderful and hard to give details. I’ve spent most vacations with my family sitting in the back seat of cars with my headphones on watching foreign countryside fly by while I made up stories in my head. I would have it no other way. And I’ve never seen more beautiful countryside than Tuscany. It’s hard to remember all of the towns we visited in Tuscany, but a couple stick out in my mind. We ended up in Volterra almost by accident. It was Halloween and we intended to go to another town renowned for being a perfectly preserved example of medieval awesomeness, but it was ridiculously crowded with Italian tourists. We couldn’t find a single place to park within a reasonable walking distance (and we don’t mind walking) and decided to try another town and Volterra just so happened to be next in line. Volterra is an ancient city dating back before the Roman empire when the Etruscans ruled central Italy. The Etruscans were an interesting lot who loved food and wine and apparently never took the time to write down their history. All we have are a ton of amazing artifacts and funeral urns. Volterra was a great alternative, and apparently it’s the Italian town in Twilight. Didn’t know that until we got there and every shop was hawking little red “twilight” apples. I also happened to have the best pizza in existence. I just wish I had written down the ingredients. Sienna is the other stop that bears mentioning. We almost didn’t get to experience the city because parking was hard to find. We ended up way out in a residential area a couple miles from the city center. Our time there was limited, but it was well worth the stop. The Cathedral was gorgeous and the central square was amazingly huge. Rest in Peace Dragon Lady. Thanks for the stories. You will be missed. Our first stop in Italy was Florence. 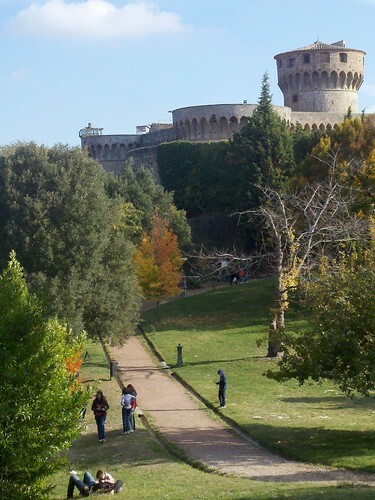 After we landed in Rome we immediately caught the express train out of town. Apparently even the best hired drivers in Italy drive like mad-men… I found it exciting, but I don’t think my mom appreciates that sort of adrenaline rush. I have to say that I really like traveling by train. Decent public transportation is something most cities around here could use. The scenery was fantastic. I think I could ride through Tuscany on a fast train past vineyards and castles until my hair turns gray. The first few scenes in a new country are always surreal. 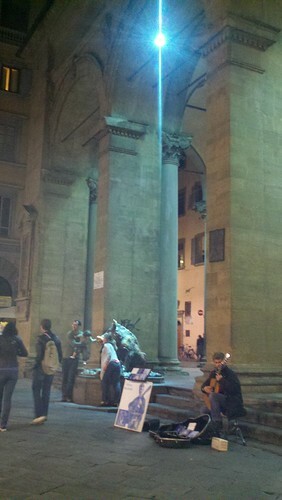 In Florence we stayed in a small hotel just a couple of blocks away from the Duomo. If you don’t know what the Duomo is, then you’ve either never had art history or your course was too easy. 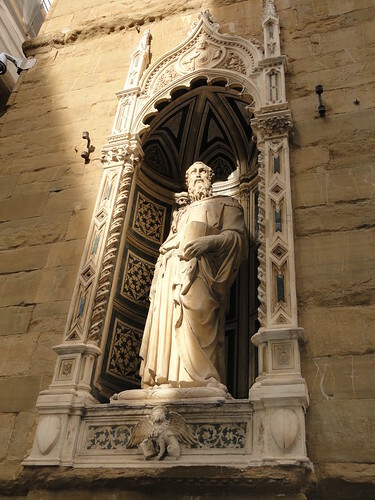 The word Duomo is actually a common word for a big church or basilica in Italy, but The Duomo usually refers to the Florence Cathedral Basilica di Santa Maria del Fiore. The Church is remarkable for a number of reasons and is an important in part because of the Doors of Paradise (check the link) and the large dome of the church itself. 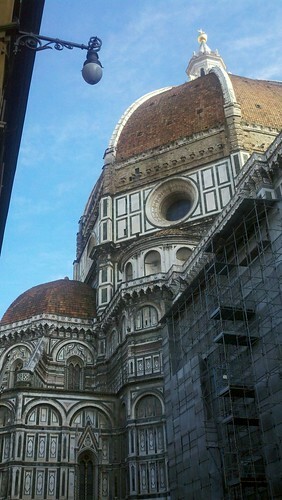 The dome of the Duomo is an amazing feat of engineering, it’s size has to be seen to be appreciated. No picture can really capture it’s incredible size. The most unbelievable part is that it was built in the 1400’s. It’s an impressive building to say the least. 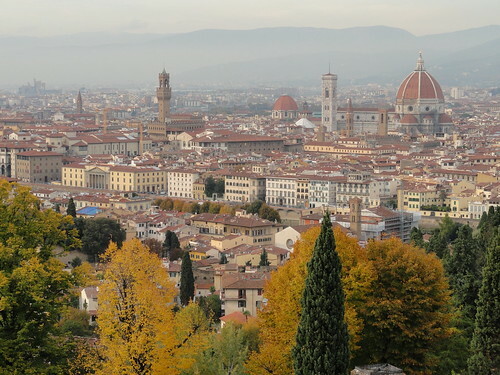 Florence is an enchanting city. At night there were musicians in the big piazzas, artists in the street, limited auto traffic, and you could walk just about anywhere you wanted to see in thirty minutes. 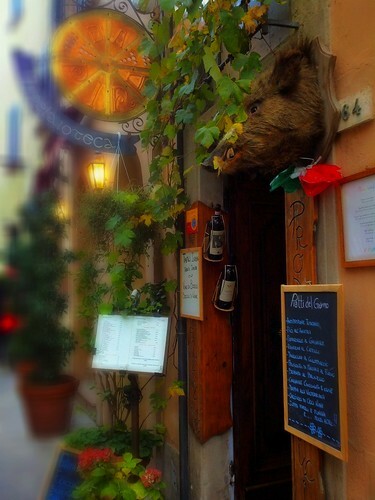 Can I just say how amazing real Italian food is? Because it is amazing. Really really really amazing. Oh, and their wine is pretty darn awesome too. And this is coming from a philistine whose exposure to wine has mostly been of the Lembrusco and boxed variety. Given that background it was no wonder why I was blown away! Wine can be quite awesome. The morning of our first day in Florence we went on a private walking tour through the city. Our first stop? 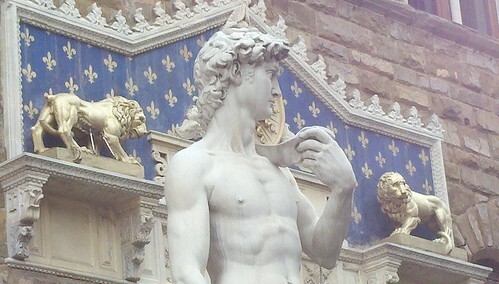 Michaelangelo’s David. I’ll be the first to admit that when I came around the corner had saw that marble hunk at the end of the hall, tears came to my eyes. There’s just something about certain pieces of art, especially sculpture, that just speak to me. It doesn’t matter that I’ve seen every detail before in pictures, nothing substitutes for the real thing. Lining the hall leading up to the apse built specifically for David are the unfinished sculptures meant for the tomb of a Pope that I’ve heard called the slaves. Unfinished as they are, they are still magnificent. The half finished figures seem to be emerging fully formed from the roughly hewn blocks of marble. 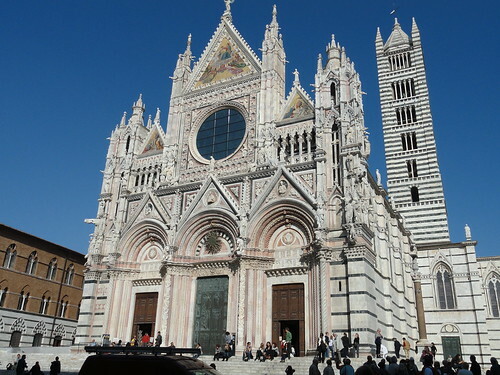 Our tour led us by the Duomo and through the back streets of the city where our guide would stop to point out bits of ancient Roman architecture scattered among the more “modern” buildings. We ended up in the square in front of the Palazzo Vecchio. 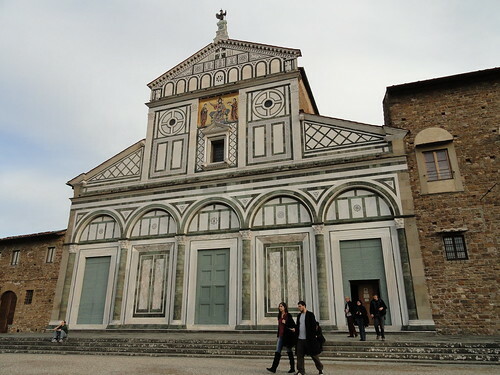 Later that afternoon we walked across the river to the South and up a giant hill to San Miniato al Monte to hear the evening Vespers. 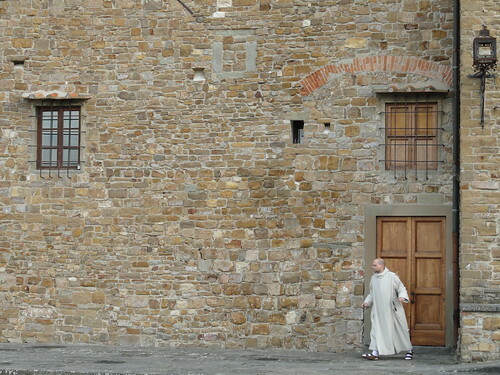 The monks there sing them everyday in Gregorian Chant. It was a profoundly moving experience to sit in this ancient Medieval Church. It’s truly awe inspiring to think that there has been monks performing vespers on that site for nearly a thousand years. Sadly the experience was marred by the tourists. People just don’t have any respect for the churches they visit. There are signs everywhere politely asking for silence, but people just stomp around talking as thought they were in a barn whether or not there is a religious service or not. No class. And no respect for either the places they are visiting or those who are there to worship. Depressing really. 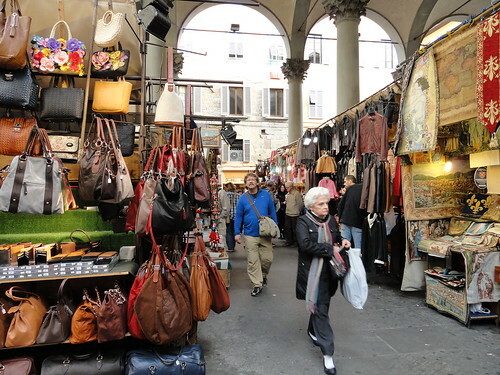 The next day we had the opportunity to visit some of Florence’s amazing artisans. The first stop on our tour was the tiny basement shop of an amazing woodworker. 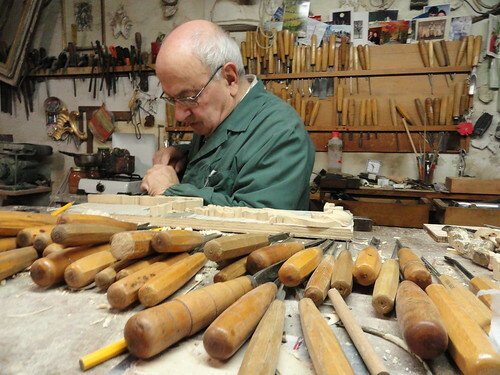 Luigi’s in his seventies and officially retired, but he loves his work so much he continues to carve and gild anyway. In a few quick hits of his chisel Luigi make an awesome swirl of filigree destined for a gilded mirror out of a flat piece of board. He even let us place a piece of gold sheet on a piece he was in the middle of gilding. I’ve always wanted to learn how to gild. I tried once for a project in college, but it didn’t really work out too well. Seeing it first hand was really really cool. Next time maybe I’ll get it to work, even if I use the fake stuff. Our last stop was an engraver. His work was beautiful and his subjects ran from shoes to bugs to cityscapes. In the days before photographs pictures in books were engraved using the same technique. First he lined the copper plate with a liquid wax, then he’d lightly scrape a line or figure or whatever into the wax so that the copper underneath was exposed. Then the plate is submerged into an acid that would etch into the exposed copper bits making them deeper. Once the engraving and acid eating was done you can print. Just don’t forget to draw the whole thing backwards or the final image will be flipped the wrong direction. 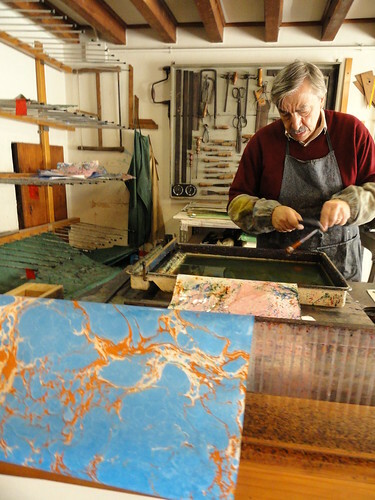 To make a print he took the plate and rubbed ink over it making sure to fill all the groves. Then he wiped off all the extra ink off of the parts that are supposed to remain white. Next the plate was carefully lined up with a piece of paper and run through a heavy duty rolling pin looking machine that transferes the ink from the crevices to the paper. It was really fun to watch and much more difficult than it looks. Mid-afternoon we had tickets to the Uffizi Gallery which houses the Medici’s personal collection. The Medici’s, if you don’t know the name, were a hugely powerful and wealthy from Florence who funded some of the Renaissance’s greatest artists. The art was fabulous. It’s hard to imagine one family owning all those masterpieces. It’s worth the admission for Birth of Venus by Botticelli and da Vinci’s Annunciation. But my favorites were the ancient statuary from Greek and Rome and of course the Caravaggio’s. I’m a sucker for a Caravaggio. I’d go back to Florence in a heartbeat. If you ever get the chance, GO! On a random side note… I loved the fact Florence’s symbols are the same as my personal heraldry (check the header). The Fleur di Lis and the lion. I am now officially interested in this movie. Where did I go? Florence, Tuscany, Umbria, Rome. In what esteemed company? My ‘rental units. I’ve got tons of pictures providing that my camera doesn’t spaz on me. It’s a particularly spazzy breed. It’s finicky about what kinds of memory cards it will eat.